Historians have refuted Israeli Prime Minister Benjamin Netanyahu's assertion at the 37th Zionist Congress that Nazi dictator Adolf Hitler did not initially plan to exterminate the Jews and was convinced by the Grand Mufti of Jerusalem to 'burn them.' However, it is beyond dispute that the Mufti was aware of the Final Solution in Europe. He played an active part in sending European Jewish children to their deaths. He had his own plans to exterminate the Jews of Palestine and the Arab world - for which he sought approval from Hitler at his famous meeting with the Fuhrer in November 1941 - and even had plans for crematoria in the Dotan Valley. 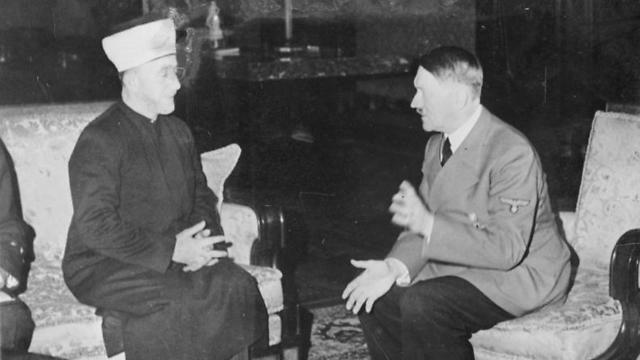 It is incontrovertible that the Mufti was an enthusiastic propagandist for the Nazis as their guest in Berlin. It is also a fact that the Arab world has never undergone 'de-nazification': the Nazi legacy of genocidal antisemitism is alive and well. "Professor Dan Michman, a world-renowned expert who is the head of the Institute of Holocaust Research at Bar-Ilan University and Head of the International Institute for Holocaust Research at Yad Vashem said Hitler did indeed meet the mufti – but this only occurred after the Final Solution began. "He flew to Berlin," Netanyahu said of the mufti. "Hitler didn’t want to exterminate the Jews at the time, he wanted to expel the Jews. And Hajj Amin al-Husseini went to Hitler and said, 'If you expel them, they'll all come here.' 'So what should I do with them?' he asked. He said, 'Burn them.'" Netanyahu also said that the mufti was sought during the Nuremberg trials but managed to evade them. He further noted that the mufti claimed Jews wanted to destroy Al-Aqsa Mosque before the war, and "this lie is about a hundred years old." Yad Vashem's chief historian, Professor Dina Porat, told Ynet that Netanyahu's statements were factually incorrect. "You cannot say that it was the mufti who gave Hitler the idea to kill or burn Jews," she said. "It's not true. Their meeting occurred after a series of events that point to this." Defense Minister Moshe Ya'alon said Wednesday on Netanyahu's remarks: "Of course Hajj Amin al-Husseini did not invent' the Final Solution to the Jewish question'. History clearly shows that Hitler initiated it. Hajj Amin al-Husseini joined him." He added that "the jihadist movements today are encouraging anti-Semitism and lean on known Nazi heritage." Opposition leader Isaac Herzog called Netanyahu's remarks "distortion of history" on his Facebook page. "No one needs to teach me how much of an Israel-hater the mufti was," wrote Herzog. "He gave an order to murder my grandfather, Rabbi Herzog, and actively supported Hitler. But there was only one Hitler. Hitler did not need Husseini to order the murder of Jews just because they were Jewish." Professor Meir Litvak, who teaches at Tel Aviv University's Department of Middle Eastern History, said the idea of annihilating the Jews came up in 1939. While the initial plan was to send Europe's Jews to an area north of the Ural Mountains so that they would die of disease, he said, the plan was nixed when the Soviet Union did not surrender in 1941. At that point, Litvak said, the extermination idea arose. "Husseini supported the extermination of the Jews, he tried to prevent rescuing of Jews, he recruited Arabs for the SS," said Litvak. "He was an abominable person, but this must not minimize the scale of Hitler's guilt."